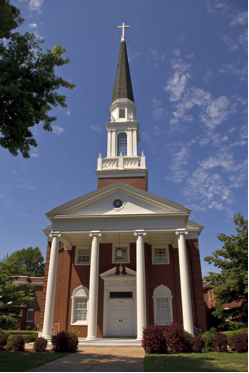 Noted for its classic elegance and beauty, National Avenue Christian Church is located near the center of Springfield and the intersection of Sunshine and National Avenue. The church is a warm, welcoming, and safe place for all people who are committing their lives to each other, regardless of race, creed, religion, or cultural background. Large or small, National Avenue Christian Church welcomes weddings for all individuals, whether or not they are members of our congregation. If you have been dreaming of a traditional church wedding in Springfield, please contact us regarding the use of our beautiful space. To access the reservation forms, click here. Must a couple utilize the ministerial services, or can a minister of their choice perform the ceremony? We would like to establish a time to view the facilities. I posted on here days ago with no response.I asked if church welcomed gay couple to use the church for commitment ceramony?If anyone from the the church has a response it would be welcomed. We have done such ceremonies before, yes. Ok,thanks for the timely response.Another question pertaining not to weddings .But ,to attending service?I am going to next services on Sunday,and wanted to know is there a certain bible the church uses during sermons? You can bring whatever you are comfortable with. We use a variety of translations for comparison. Most often, we use some of the more recent inclusive translations or the New Revised Standard Version. Does this Church perform Commitment Ceremonies for straight senior citizens ? Yeah. Give the office a call this week to get more info. How many people does your reception hall accomodate? Thanks for your interest in our building. Please give our office a call to get more information! I am interested in having my wedding at you church. I have been unable to get anyone on the phone. Is June 28th, 2014 available for a wedding? How many people does your large chapel hold? Thank you for your time. Thanks for your interest in having a wedding at NACC! Please try calling the office tomorrow (Tuesday Jan 7) during office hours (9am-4pm) and ask for Laura. If you get voicemail, leave a message and someone should return your call soon. How much would it cost for 2 hours for a wedding ceremony? Please call the church office for more details. How many people fit into the chapel and sanctuary? Please call the church office for more details about our wedding spaces. I would like to set up an appointment to tour the facilities and discuss availability. Thank you for your interest. Please call the church office for more information. Our office is open Monday-Friday from 9am-4pm. Please call to set up a time during office hours or after hours if needed. Im interested in more info on the utilization of the church sanctuary.I wanted to inquire of what the landscape is like for an outdoor wedding? Thank you for your interest! Please contact our church office at 417-869-9176 for more information.